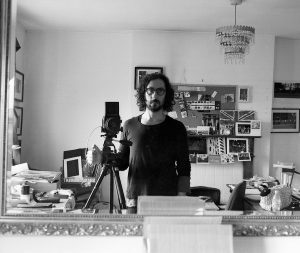 A photographer, filmmaker, designer and IT engineer, Hydar Dewachi’s practice fuses images (photography and films), design and technology, often in a documentary, semi-autobiographical context. Over the past 15 years, Hydar has developed a career working in the fields of creativity and technology. Since 2010, his commissioned work has ranged from photography, short films, web and print design, online content curation, digital and technical consultations. His experience spans working with individuals and across a diverse spectrum of sectors including creative industries, charities, education, arts and performance. Some of the organisations Hydar has worked with include ACME Studios, Artsadmin, Camden Arts Centre, CGP London, Corali Dance Company, Culture+Conflict, Film and Video Umbrella (FVU), Gasworks, Grizedale Arts, Hayward Touring, Heritage Lottery Fund, The House of St. Barnabas, Ibraaz, The Independent Film & Television College (Baghdad), Jerwood Visual Arts, Kamel Lazaar Foundation, KCIL, Lower Hewood Farm, Parasol unit, The Photographers’ Gallery, Picturehouse Cinemas, Platform Nord (Norway), Serpentine Galleries, Simon Lee Gallery, Station House Opera, Tate, Townhouse Gallery (Cairo), UCL Art Museum, University of Agder (Norway), UP Projects, and V&A Museum. Artists I worked with include Anne Bean, Bobby Baker, David Cotterrell, Emma Waltraud Howes, Paulina Olowska, Emma Smith, Florence Peak, Khyam Allami, Marcia Farquhar, Noëmi Lakmaier, Zatorski + Zatorski. Prior to 2010, Hydar worked for two years providing technical support for Microsoft’s Online Advertising and four years as IT Support Manager for KnowledgeView: configuring, deploying and integrating web-based editorial systems for daily newspapers in the Middle East and the UK including the Independent News and Media in London. Hydar has a M.Sc (1999) and B.Sc (1996) in Electronics and Communications engineering from the University of Baghdad.